192 rolls (i.e. 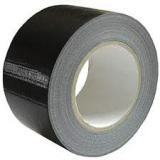 8 boxes of 24 rolls) of strong black duct / gaffa / cloth tape, each roll being 50mm x 50M. An extra strong adhesion and perfect for securing leads, wiring etc as well as many other uses. This is the strongest tape available on the market.